First, the Digital Repository Service (DRS) Image Delivery Service now implements the IIIF Image API. This allows any IIIF viewer to display an image or image region for the over 16,000,000 still images in the repository. Second, the Harvard Library IIIF Presentation API service provides IIIF access to over 235,000 page turned objects from the DRS, including digitized books, manuscripts, diaries, and other digitized archival and library material. Third, the Library has implemented Mirador as the viewer for DRS images and page turned objects. See this link, for example, to see the Harvard Library Viewer display a medieval Book of Hours from Houghton Library. The Mirador image viewer makes use of deep zoom technology via OpenSeadragon, an open-source web-based viewer for high resolution zoomable images. Harvard Library has adopted IIIF as the standard for sharing its digital image content with the world. IIIF enables rich digital resources from Harvard’s libraries, archives, and museums to be accessed by any IIIF compatible viewer for research, teaching, and learning. Library Technology Services, a part of Harvard University Information Technology, adapted Mirador to serve as the viewer for the Harvard Library’s digital holdings. 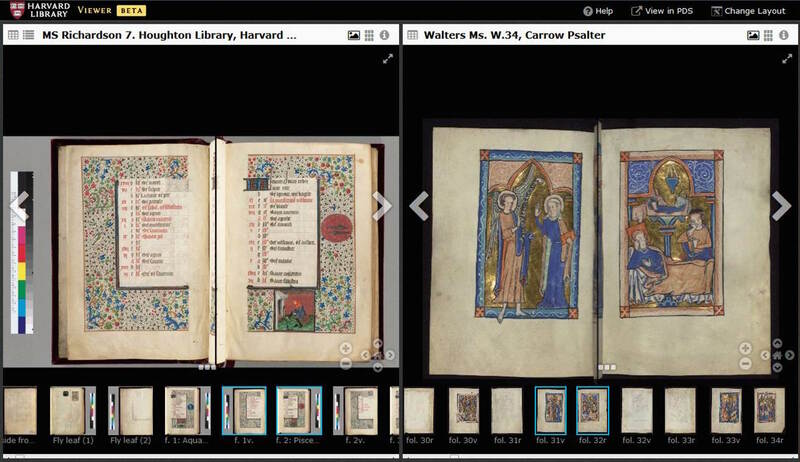 Mirador’s side by side viewing ability enables scholars to view and compare documents from Harvard’s collections along side documents stored at other IIIF repositories. The large and growing size of the IIIF community – including peer institutions such as Yale, Princeton, Stanford, Oxford, and others – opens opportunities for collaborative and cross site research that has not been possible before.